If you are here, you probably know enough about what’s going on here that not much explanation is needed. I’m obsessed with making pipes, and lucky enough to be able to do so from time to time. The fun I have at this is off the charts, and the relationships I’ve established over the years mean a great deal to me. This is all very personal, and it’s one of the aspects in my life which I have basically total control over. That doesn’t make my pipes perfect, it makes them mine. It took a few years for that to sink in. So here we are: this pipe-nerd’s paradise. The shop has morphed from being a multi-purpose hobby-guy place (with lawnmower, camping gear etc) to being a pipe-centered work area. It’s one of those “how does he work out here” messy artiste sort of things. Files everywhere, pieces of sandpaper floating loose. Sketches and cutouts, blocks of briar laying around promising to be something. It’s my place, my sanatarium, a refuge from the noise and color of the real world. It’s a place I control. It’s the only place I control. Not many people have such a thing, I guess. And the fact that mine is full of weird tools to make anachronistic devices with arcane methods…. well that should surprise no one. Also, turn up the CD player, would ya, cuz Black Sabbath. There is a lot of careful work. There is engineering and art. And there is briar. I build pipes along similar lines to the specifications laid out by Rick Newcombe in his article “Your Pipe Should Have and Open Draw”. Namely, largish airways (5/32″ or 11/64″) through the stummel, tapering in the stem. I cut and file a very deep slot. The overriding idea in pipe construction is laminar flow from bowl to button, offering a minimum of condensation and a maximum of flavor. Making really good pipes is always a priority, and in a sense, mastering making a pipe that is really pleasant for the user was more important to me than being the best sandblaster, or having the shiniest finish in the industry. Making good pipes was enough. It’s hard enough, and the product is desirable enough. So you’ll see a lot of dressed-down shades of brown and black here, old-school looks for the most part. Whatever the aesthetic, there’s no compromise on drilling, airway construction, or material perfection. Now, I do not want to wax etherial here, but briar is pretty important. Bad briar makes bad pipes, and it can’t be rescued. Luckily, we live in a sort of golden age, where we have all kinds of choice for supply, and even a pipsqueak like me can talk directly to the briar cutters and get incredible stuff. And that’s what you get if you buy a pipe from me. You get the best that I can find, the best that I can do with it. Whether it’s “high grade” or not, I love rusticated finishes. I know there are plenty of “blast only” guys around, and that’s great. It turns out not every piece of briar is going to blast nice, and it turns out that a deeply and well cut hand-generated texture is totally wonderful. This is not a case where I have a piece of briar that is punky or garbagy in some way so I decide to hide it. 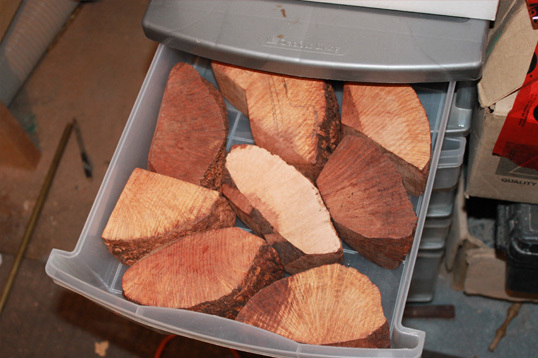 Garbage wood goes in the garbage. I rusticated when I have a cut that I don’t think will make a nice blast, or simply when I feel like it. For example I recently bought some old-stock wood. It’s terrific, everyone loves it. But it’s not cut worth beans. I can’t get a straight-grain out of it to save my life. I could get a random-swirl smooth but generally I like my smooths to have a little more visual punch than that. So, crank out the tools and carve that finish! In no way are the pipes inferior. I don’t charge quite as much for them – any pipe could be textured, not every pipe could be an eye-grabbing smooth. That’s all. One thing I generally won’t do is coat a chamber with any sort of pre-carb mix. 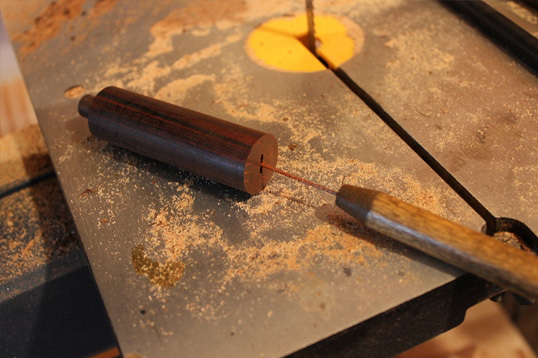 This is done by the makers who do it both to protect the wood and to make the pipe look sharper in photographs. 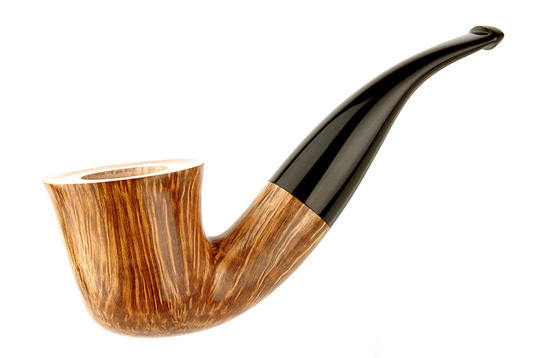 I’ll coat a pipe if the entire piece is black (the open chamber looks a little odd), or if I think the shape is thin enough to maybe warrant a little extra protection. When I use a coat, it’s a carbon/sugar mix that burns hard onto the wall in one pass. Vaguely sweet for one smoke, then totally transparent for flavor after that. The briar I buy is good. I sit on it long enough to season it, and with just a tiny bit of care in smoking the first few bowls, the pipe will offer lasting enjoyment. On one end of the spectrum you might place corn-cobs (and probably drugstore burley). A daily thing, used to the point of ruination and replaced as needed. On the other end, that temperature-controlled cabinet full of smokable art that has never been smoked (or even touched). Just about everything else is a mix of tool and art, function and form. And I’m happy to sit right there in the middle. 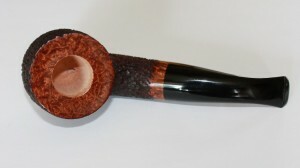 I hope to make a nice looking pipe, but if it doesn’t smoke well, the whole thing is a waste of time. I’ve watched the worm turn in both directions – seen guys start out with a beat up dirty old pipe they paid 4 dollars for or found in an attic, and as they learn that the green-gray rubber stem makes everything taste like sulphur, they upgrade. I’ve seen hard-core collectors learn over years that their reversed spear-turtle is actually pretty hard to carry around and smoke, and then they go buy a straight billiard and begin to appreciate the experience viscerally rather visually. I think most people are not likely to drop a thousand bucks on a pipe. I’m not going to, because being married isn’t so bad. But I also know that there are tons of pipe guys who appreciate nice stem work, good finishing, proper internal geometry, good briar. And that’s the target market here. Call it what you will, the “serious” crowd in my experience has been none too serious! The people who derive pleasure from fine things come in many forms. WHAT IS A “HIGH GRADE” PIPE? I don’t know. Certainly you’ll see the term used here and there, and pretty often about pipes that don’t qualify. The best working definition I’ve heard is “If you are selling pipes for four hundred dollars and there is a line up, you are making high grade pipes.” This is to say, that a group of buyers has recognized that your work is superior. Another way to phrase it would be to say that a true high grade pipe is a pipe that couldn’t be improved upon – the best of its kind, to steal a phrase from Alfred. 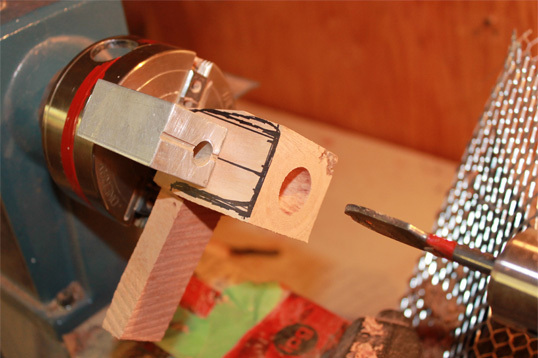 From the finish to the shaping, the mechanical side, the wood… everything should be un-improvable. Which is to say, there aren’t many of these pipes around. But that’s okay. There are lots of really good pipes around, and mostly that’s what I am shooting for. If I see an improvement for a pipe, I’ll do it. I will in the course of time be releasing a secondary line of pipes as high-grades proper, in very short supply, and only on an off-the-shelf basis, not as an orderable piece. It’s too difficult to make utterly flawless pipes to spec on demand. A friend of mine once suggested that the best pipes aren’t available. I told him the notion was ludicrous. His explanation was as follows: The best pipes are never available. They never hit the market. They are sold behind closed doors to waiting collectors. They are made bespoke for smokers. They are hidden away, not traded away. They are bought at shows immediately, never hitting the floor. They are essentially the secret dark side of the market. Estates? All pipes someone didn’t want. Those pipes up for sale on the big website? All pipes that didn’t get the secret nod-and-wink routine. Now, this is obviously not precisely true. There are plenty of excellent pipes for sale and plenty of ways to buy them. Who knows which estate pipe was someone’s favorite in 1954? Lots of brands make lots of excellent pipes. But the VERY best? Well…. Maybe he’s right after all. Maybe you have to dig those up for yourself somehow.